Seljuk architecture is characterized by pishtaqs, large portals projecting from the facade of a building. In Kayseri they are associated with a medrese, a college for instruction, usually of a religious nature. In Islamic art in general the key aspect of a portal is its muqarna, a system of projecting niches above the actual entrance. Seljuk portals featured relatively small muqarnas, while more attention was paid to the decorative bands which frame them. In Selimiye Medrese the bands were based on geometric and vegetal designs, but in other pishtaqs also bands of calligraphy and of glazed tiles were used. Kulliye is an Ottoman term used to describe a complex of buildings around mosques. Huand Hatun Kulliye was commissioned by Mahperi Hatun, the wife of Seljuk Sultan Alaeddin Keykubad I and it includes a hammam, a medrese and a turbe in addition to the mosque. The medrese, where once Islamic Law was taught, is now a small shopping centre with a cafè where it is nice to sip a tea. Its thick walls filter the noise of Kayseri's very busy traffic. The arcaded courtyard is dominated by a large pointed-arch iwan. Cifte Medrese is so named because it consists of two adjacent buildings. The eastern one was a darussifa, a medical school built by Sultan Giyaseddin Kaykhusraw in 1206. The other was founded as a hospital by his sister Gevher Nesibe Sultan, who is buried in a turbe inside the building. The complex is the oldest hospital in Anatolia. The hospital has a finely decorated southern portal. Today the building continues to serve a medical function as it is used by the administration of the Kayseri medical school. Kayseri is an important centre for the funerary architecture of the Seljuk period and of the two following centuries during which the city was often the capital of autonomous principalities. It houses a considerable number of kumbets (turbe - tombs - with a domed/pyramidal roof) some of which were built for a Hatun, the wife of a sultan or a governor. They seem to have been more decorated as compared to the kumbets for men. The design of Cifte Medrese influenced the construction of Haci Kilic Medrese and Camii, a nearby complex built in 1249, when the Sultanate of Rum was split into three smaller states which were all vassals of the Mongol Empire. The mosque and the adjoining medrese have identical portals (the minaret is a modern addition). Maybe because it was located outside the city wall, the complex has the appearance of a fortified site. Towards the end of the XIVth century the Ottomans conquered Kayseri, but after they were defeated in 1402 by Timur the city was assigned to the Karamanids and later on was ruled by local beys. Eventually Sultan Selim I (1512-1520) expanded the Ottoman Empire eastwards and Kayseri was annexed to it. The introduction of Ottoman jurisdiction meant that Christian families were subject to the devsirme tax. They were exempted from joining the army, but one of their children could be taken and trained to become a member of the Janissary corps, which directly served the Sultan. The first implementation of this rule in the region of Kayseri led to the enrolment of a young man aged 23, who was to become the greatest Ottoman architect. He was given the Islamic name of Sinan. After he became the supervisor of all constructions in the Ottoman empire Mimar (Architect) or Mimar Koca (the Great Architect) were added to his name. A mosque built in Kayseri in 1574 is attributed to him (see his masterpiece at Edirne). A later example of Ottoman art in Kayseri is provided by a library adjoining Ulu Camii (page one). Nevsehirli Damat Ibrahim Pacha was the Sultan's Grand Vizier from 1718 to 1730, a period of unusual peace marked by a process of westernization of the Ottoman society. He was born in Muskara, a small village to the west of Kayseri, which he turned into a town (Nevsehir = new town). He did not forget Kayseri which in 1723 was provided with a new han. Now it is occupied by carpet sellers (upper floor), while the old stables have been turned into warehouses for storing raw wool. 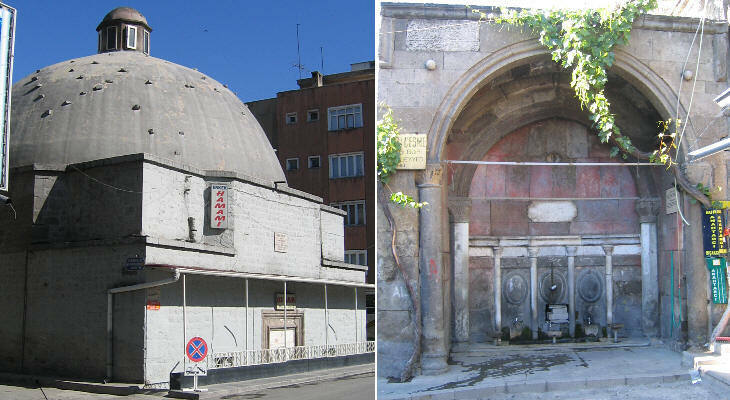 Due to its proximity to Mount Argaeus (which houses a small glacier), Kayseri had a reliable supply of water which allowed the construction of several fountains and large hammams. 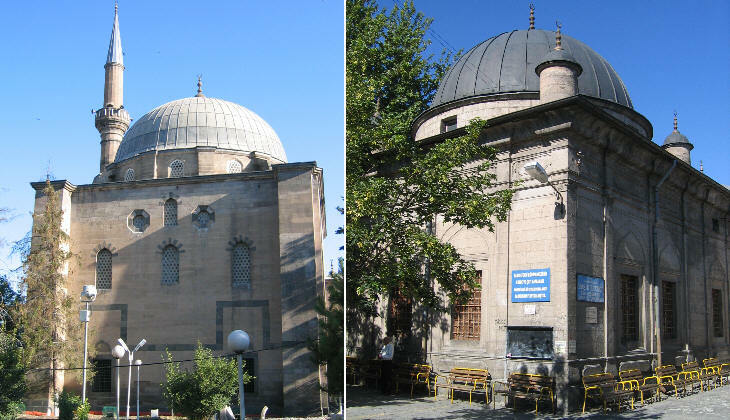 Kayseri is a stronghold of the most religious section of modern Turkish society and many mosques have been built in recent times to emphasize this aspect. There are however some reminders of the beliefs which were practised in its past. A large han outside of Kayseri on the road to Sivas was commissioned in 1232 by Sultan Alaeddin Keykubad I. It is the second largest Seljuk caravanserai in Turkey. As a fortified way station along the trade route, it was built of massive stone walls with only one entrance. 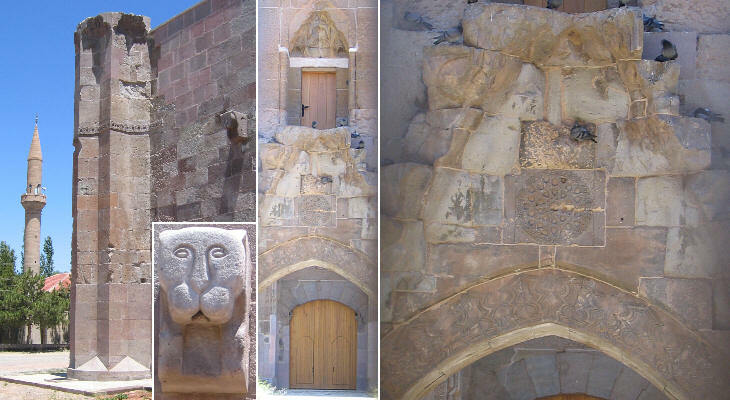 Its fortified aspect is enhanced by towers having different shapes; between them there are drain spouts carved as lions, a symbol the sultan placed at the entrance of the citadel in Kayseri (page one). From the entrance one passes through the thickness of the walls into the courtyard, in the middle of which is a small mosque set on arches above a fountain, with the prayer hall on the second floor, reached by a double stairway.